Applying heat evenly to the product eliminates hot spots thus preventing damage to more sensitive materials such as sugars and glucose. Effective and simple the silicone side heater gives exceptional performance incorporating a 0-120°C capillary thermostat or 0-180°C electronic thermostat that delivers precise and even heating from accurately positioned PTFE coated, multi-stranded resistance wires. These wires are laid widthways throughout the heater giving superior flexibility while negating the physical stress caused by thermal expansion during operation. A simple fixing arrangement via a hook and spring provides swift and easy installation. 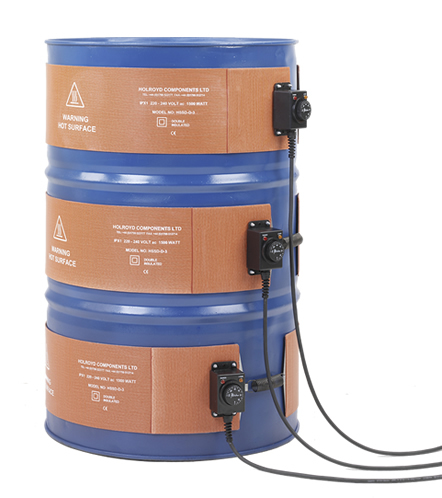 The silicone side heater reduces the viscosity of materials such as soaps, fats, foodstuffs, varnishes and chemicals allowing them to be pumped or poured with ease.